Sissinghurst Castle is one of the most famous and delightful gardens in the British Isles. Sissinghurst Castle garden was created by Vita Sackville-West and Harold Nicolson who transformed the ruins of this Elizabethan mansion and gardens in the 1930s. The castle tower dating from the 16th century is virtually all that remains of the grand Manor House. People come from all over the world to see the Garden which is administered by the National Trust. The garden is divided into a series of rooms filled with informal arrangements of plants around a theme: the White Garden, the Purple Border, the Rose Garden, the Herb Garden, the Lime Walk, and the Cottage Garden. The White Garden with rosa mullingani has cascades of white flowers and is surrounded by other white and grey plants. The Head Gardener at Sissinghurst is now Troy Scott Smith who moved from Bodnant Garden. The Head Gardener at Sissinghurst is now Troy Scott Smith who moved from Bodnant Sissinghurst Castle Garden Garden. 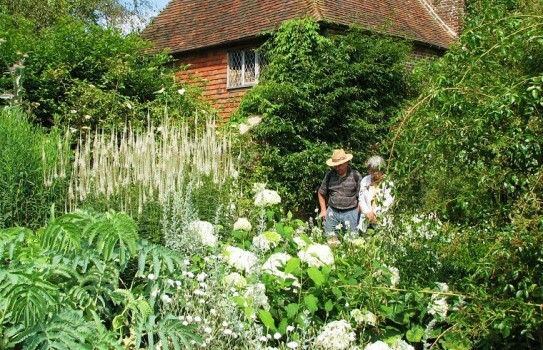 Sissinghurst Garden is one of our top 20 gardens in the British Isles and is a must visit for the garden lover. For Sissinghurst NT 2019 opening times see website for days and times but gardens are open most of year. We have all the information you require including map and accommodation nearby. Do not Miss Vita's writing room and take time to climb to the top of the tower. The wider estate is over 400 acres which you can explore, walk the dog or cycle.